WHY IT’S GREAT: This meal is cheap and easy. Simplicity with a mouthful of flavor. Smooth, creamy and comforting. Not the New Yorker’s everyday meal, but could easily be – especially in the colder months! WHAT’S ON THE MENU: Step out of Manhattan and into China. You will be tasting a traditional Cantonese dish called Congee. 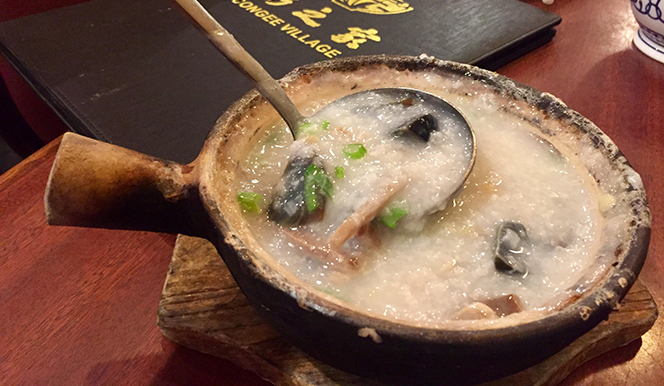 This white rice porridge served in china-made clay bowls and filled with preserved egg, tender & juicy pork and a hint of scallion will be sure to please both your mind, body and spirit! FUN FACT: The word congee comes from the Indian word “kanji,” which refers to the water in which the rice has been boiled. The process of cooking a small amount of rice in a large amount of water helps to create and formulate a rich texture. In the Chinese culture it is known that congee serves multiple purposes. One such purpose is to warm the body as well as taking the place of a beverage, as the Chinese don’t normally serve cold drinks. Also, it is believed in Chinese medicine that congee gives our digestion a break which promotes healing in the body. Congee is highly recommended for people suffering from fatigue, digestive problems and illness. It is easy to digest and contains nutrients in ready form to be absorbed and used, thereby enabling quick revitalization of the body. THE SPACE: Great for a cold winter night or a cool fall day, Congee Village is cozy, authentic and welcoming. From the exterior to the interior, the restaurant is personalized and stylized with wood. The varnished wood work starts outside and works its way in. Large wooden tables and chairs are not an everyday decor in NYC restaurants, which creates a different side of dining here. Brick walls, tiled floors, shrubbery and colors of green and brown surround and fill the space with warmth. The restaurant seems as if it goes on forever too! There are so may rooms, each differing by the slightest bit. At the start of the Lower East Side and end of Chinatown, this spot is not to be missed on your way out. COST: $4.95. Easily eaten alone or shared for two.